I have just implement same app like this for the event as a dot which display events. please share the code for this. I also need to implement app like this. please share the code for this as soon as possible. I just doing some re factoring work in the code so I will provide the code soon, may be today evening with complete tutorial with the source code. Can you provide whole source code? In this calendar is the event which is display as dot is a static data??? I have downloaded the code but in this the dot does't appear according to event. In this calendar demo code I am using Static Array list for storing the event.But the good practice is to make a class Object for storing the data and then fetching the data from it. Hello mukesh can you share youe email id please?? I am surprised , the same code I was using on my Htc phone and its fetching all my calendar events. Yes..But right now i am testing the app on emulator. And is it necessary to create a calendar account for that?? 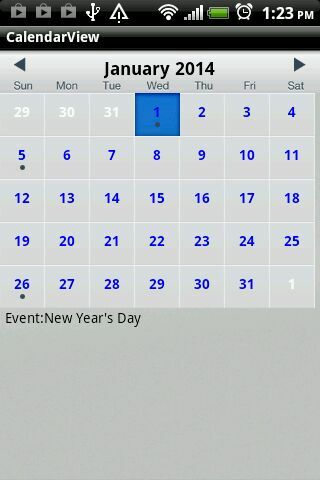 In android phone there is a calender application. So try to run this sample on real android device instead of emulator. Also before running this please be sure that calendar application will be installed on your device, as in lower version of device (2.2,2.3) we have to download the calender app from google market. OK..... But i have a little bit confusion when i have run this on real device then first no event display..but after enter in calendar app i have create a event so i can see event in this app as dot...so my que. is my data is coming from server so for add event everytime i have to go to calendar app??? Yes , If you device is sync with gmail account or you are login with gamil then its show all your google calendar event. Else you have to add manually. my above custom calender view code when I am populating or creating the calender view at that time I am checking if the calendar date is present in the object or not. if there is a date present in object , I just fetch the calender event corresponding to that date and bind it on the calendar. Check the logic where I am binding the event on that date from array object,and try the above approach which I said.I am sure its work charm for you. i'm also copy paste this code but not getting run this app it force close at cursor event able columns not found. I think your are execution this code in your android emulator. Try to run on android device then let me know if it is still crashing or not. I have test this code on HTC Explorer v-2.2.Its working fine. This is a permission issue,Please add Calendar permission in your AndroidManifest.xml file. Hey thanks Mukesh its works me fine, can u guide me how to add Events in Calender, like Birthday , meeting and i want to keep alarm for that , It is possible?? Yes, we can add alarm also. 1. Regarding adding the event, its depends on you from where you are getting these event,(I mean by webservice). If you simply syncing the google calendar then simply open your google calendar add all meetings,event or birthday.These appliction will fetch all those events in the custom calendar. You have to make few change in above code...in my code I am comparing the current date with map of date event and binding all the event of current date.So before that you check the month and then even...few extra looping required in above code. Hopes now you got some idea. Also Utility.startDates , here I am storing all events in an arraylist. Hello Mekesh Yadav, i'm a student in Korea. i need ur code for my app for contest. So, can i use ur codes for my app? Yes , sure not an issue. How do you get the window popped-up when a user presses on a specific date for more information. And at the same time, the user closes the window when the user exits the window. On what database would you recommend to sync the calendar and the information on specific dates? but I am not able to do that. Can you please provide the code for this ? Then it will help me to learn this thing. 08-01 12:06:36.180: E/AndroidRuntime(12883): java.lang.NumberFormatException: Invalid long: "null"
Hello Mukesh i want to display calender inside the alert dialog exact like you so how to do this. u share ur code for the events..
You just need to change the array list of date according to your need in Utility class, and rest remain same. Can i please know about the license terms of this project??? can you please help me out with license terms of this project Mr.Mukesh??? this is an open source code demo, there is no license or Policy. Feel free to use it. I have added the git repository of above code at the of the blog.You can also download it from there and Also I will just going to drop the code on your id . I GOT THIS ERROR, WHEN I TRY TO RUN THE ZIP FILE. Please check the permission in android manifest file. Your code is awesome,I am not able to download the code.Can u send your code i just implement that and made changes accordingly. this is mail id sudheer.412@gmail.com..If u send that will be very useful for me. Thanks in advance..
Did you take the zip file down? The gitHub download link appears to be unavailable. Hello friend,I just updated the git repo linked.which was broken....sO please check now. Also , thanks for sending me email regarding the broken git repo link. Great basic Calendar! It's a great starting point for me because it's easy to modify. Is it possible to modify this code so that the calendar app synchs with a different Google account other than the one associated with the phone? Yes, but for that first of all you have to login with that account via your code using google+ lib and then fetch all the events. .query(Uri.parse(calendarURI), ..." I think I also need to append a password for authentication. Can you please show me how I can do this? have you figured this out yet? I am currently working on the exact same problem and am having issues with it. hello...i downloaded the zip..but it is showing null pointer exception...could you please help me..
What should we do to begin Monday. Hi, I am a relatively new android programmer. I am trying to pull data from a database and incorporate it into the calendar. I am storing the event and time in two different columns. What would be the best way for me to do so? I am a relatively new programmer and am designing an appointment app. I would like to change the events from a database. I currently have the event and the date stored in my database. How would I change the code to make it change from the Uri to a database? Would I only change the Utility.java or what else would I need to change? I would greatly appreciate your help. Yes.... you have to parse the event and then add that in object or arraylist. I've got a problem with your example. When i run it on my emulator it works fine, but on my real german android device (xperia arc s) it appears an error (... has unfortunately stoped). i think it's because i have a German device with a German calender, but i don't know. Mukesh thanks a lot, such an amazing code, but now i need to show List just of calendar Grid to show current month events, how can i do this? 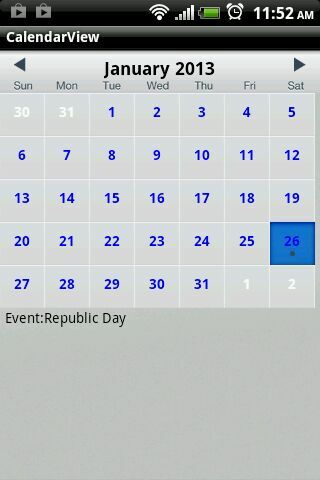 Try to run this on device bcoz it fetching events from gmail calender or from your phone calender app. 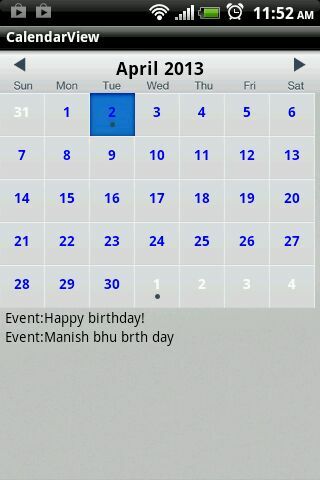 If there is Calender app on your emulator then first add some event on it. Use facebook sdk and first get all calendar event then add those event on the calendar app. Can you please give me detailed explanation on how to sync with facebook for friends b'day. Its great. Can u update the code. When I select one day in previous or next month on the calendar then it display the next month calender, It doesn't highlighted the selected day. calendar provider class is the in build class. Tell me what exactly you want to do. The above code is doing the same...check the Utility class there I am using for loop to get all calendar event before that u have to add this code. The Calendar is Working great,I need to display only the current week in the gridview.I am hard to find out the problem.Please help me to solve the problem. I think when there are more the two calendar accounts. 01-24 15:14:37.497: E/AndroidRuntime(11075): java.lang.NumberFormatException: Invalid long: "null"
I've been getting an error with endDate. Any idea why this is happening? 01-24 22:58:20.823: E/AndroidRuntime(12538): java.lang.NumberFormatException: Invalid long: "null"
How to display a particular (specific date) in calendar.Is it POSSIBLE? [2014-02-10 16:56:13 - CalendarView] Conversion to Dalvik format failed: Unable to execute dex: java.nio.BufferOverflowException. Check the Eclipse log for stack trace. Hi Mukesh in your source code if i set event for current year its not visible in next or previous years of calendar. Please reply as soon as possible its urgent need to implement its my project. When i run this in emulator, it says unfortunately the calender view has stopped.Please tell me the solution. I have a date stored in the SQLite database. How can I highlight that date in this calendar? hi Mukesh and thanks for example . but I have got a problem .
" ....source not found sdk\platform\android-8\android.jar...."
thank you mukesh, and i have a question, how can i activate the swipe control to get the next month in the calendar? Hi, Mukesh, Thanks for your nice code. I found a bug in it because I used many services to generate my events on google calendar and so..
On my smartphone your app crash because found some events without end date. so.. I have changed piece of code that read events to printout events title and date of events that return null as end date. and also "correct" to go on and enter in your app. I just start to develop on Android so now I don't have good skill to investigate on event Database but I'm very curious to know if in row elements of event there is some info about service that generate event and so the null end date. How can I get more info about an event? My question to you Can it is possible??? suppose I am creating one Database table and then Add some events in that table and when I open calendar in my mobile device so that events is automatically bind in calendar view..
How to change first day of the week to Monday instead of Sunday? Do you find any answer? I have the same problem... Thanks! ThankYou for this nice code. I have some some problem with this, this calendar still displays the events even if it is already deleted. Kindly help me with this please. Se puede capturar el evento del click en una fecha? Yes, It is possible to bind the event from database.You havr to make change in utility class. Hello Douglas, i need sample code please share your sample code. Hello Douglas, check the adapter class. You need add few line in it which check your event and based on that event you can apply different cell color. why you delete my post ? I can change the color of the selected item according of the event but only when is selected, i need to do so on every item when the data is loaded from utility class. I really appreciate the help you can bring me. Hello Mukesh, thanks for answering and sorry for delay, i have almost a week trying to get it to work and i can't can you give me a hint on this? I would really appreciate it. Thanks! Hello Mukesh, I really like how your calendar example works. I'm trying to modify it so that it pulls events from my own mySQL database. Can you show me how to modify the code of your Utility class so that the data from a MySQL database can be displayed rather than the on-device calendar database? In my database, I've created the same fields you have: "calendar_id", "title", "description", "dtstart", "dtend","eventLocation". In my AsyncTask, should I bundle this data as HashMap, or ArrayLists or String Arrays? And can you show how to re-write the Utility Class to use this data? Thank you! Hello Mukesh, could you please show me how to re-write the Utility Class using my own ArrayLists (calIdArrayList, calTitleArrayList, calDescrArrayList, calDayStartArrayList, calDayEndArrayList, calLocationArrayList) rather that calling the on-Device calendar database? I am creating a simple app to retrieve the events from the calendar. Can you please tell me how to do it? Can it be done using just the Intents? This code works only on Android versions below 4.0. What i did was to rewrite the utility class to load data from MySQL and the error is gone. Recurring events are not shown. That means birthday does not shown year to year. 4th june ,2013 birthday event only shown to that day. I cannot see it on next year. Whereas it shown normally on device calender. Can you please fix this issue? It is a really good Job, but I need to change first day of the week to Monday instead of Sunday, any idea? Thanks! can you please m me some ideaz How to develop a hindu Calendar?? how to add events coming from webservice to your custom calendar?? First of all thanks for a such great tutorial. Because of your tutorial now i don't need any library project. My question is this is month view of calendar. So is it possible to create week view using same code? If yes then please give me some idea. Yes , week view is also possible. share me your view then I will give you the proper Idea . UI is similar to this project only current week will be displayed. Next button will display next week and previous will displayed previous week. I'm trying to get this to run on 4.4 as well. What do we need to do to get it to work? I'm trying to get this to run on 4.4 but it didn't work.We use code in our project.Can you reload code? How to get the calendar full Screen like to default CalendarView in API? Tried the match_parent etc. couldn't stretch to Full screen? Can you help me on this please? Hi mukesh will you send me source code. my email id is jaypeemishraec@gmail.com. I want same functionality with dynamic data. please he me. First of all thanks for a such great tutorial. default calender so that whenever you are showing your custom calendar view it fetch the event and bind it on the view,which I am doing in my Utility class. calendar date from the arraylist. hi mukesh r u there? when you are adding data into database at the same time insert those data into android default calender which I am doing in my Utility class. How to block dates before current date? Yes, Its working fine for Year-2016. In your case might be there is no event added in calendar for Year-2016. Please check.....you can also check it by adding some event manually. please let me know if still it doesn't worked. Hello mukesh, Pleas send me a sample code for how can i add event in the calendar. I tried doing it but unable to achieve. Please send a sample code that will help me in showing the events in the calendar. Hi mukesh, please help me out in adding events in the calendar code above. I have a list of dates and need an Dot on the calender date (indicating that date has a event). Please send me a sample code as i m finding difficult in achieving this. 02-15 13:22:08.120 24874-24874/? E/AndroidRuntime: java.lang.NumberFormatException: Invalid long: "null"
02-15 13:22:15.009 24874-24874/com.example.nidhi.hiral_calendar I/Process: Sending signal. PID: 24874 SIG: 9. Add null check and check the format...as you are facing the ava.lang.NumberFormatException: Invalid long: "null"
i am getting this error in my locat. Really nice tutorial.Please tell me how do i allow the user to add his own events on a particular date and display the dot as you are doing. plz reply asap. Hi man. Thank you for you tutorial. I just want to know how can we have a 7*6 calendar instead of 7*5? Hi Man. Thank you for your great tutorial. I was wondering how can I have 6*7 calendar instead of 5*7? Thank you so much. Hello Mukesh, do you have code to bind the event from database?